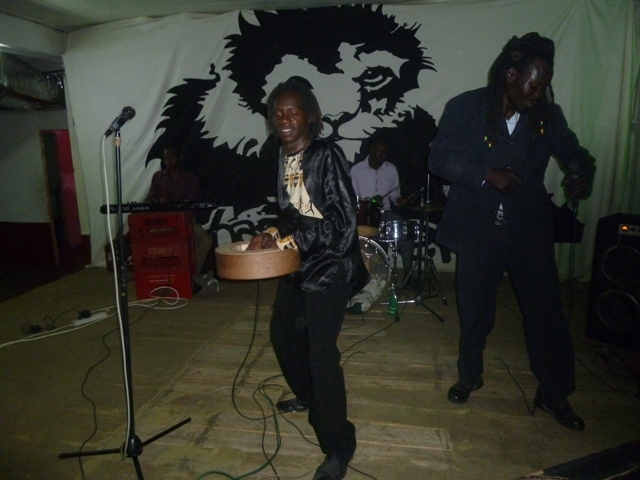 Harare, Zimbabwe – Fresh from a study and music tour in Germany, nyunga nyunga mbira maestro Taku Mafika and his band, Tru Bantu, lit up the newly renovated Bassment Nightclub on Wednesday with fresh beats from his upcoming album. Wearing a dashiki, the husky voiced musician showed mastery of different genres of music but putting his signature nyunga nyunga tune as he sampled songs from his forthcoming album titled, “Black to Colour.” The music on his new project, which is constructed using an eclectic selection of musical instruments, portray Mafika in a whole new light. His lyricism touches on a wide range of issues, including, love, freedom and peace but the ultimate beauty of his work is in the precise manner in which he plucks the mbira keys and makes them sing. A fervent crowd at Bassment Nightclub danced intensely for almost three hours as Mafika went through his musical repertoire with gusto and evident passion. “I feel exhilarated to be back home performing in the motherland and before an audience I know best. We’re making art with the mbira and taking it to a new level. All I can say is that I want to move to a whole, new international level with my music. The response, thus far, has been positive both locally and in the countries that I’ve performed in abroad,” said Mafika who is also a UNESCO-ASPNET Schools coordinator in Zimbabwe. While in Germany, Mafika said that he was involved in media competency and journalistic studies. He also performed at the internationally acclaimed Intercultural Summer Party, a cultural festival that brings together changemakers from around the world to promote intercultural learning. Mafika reiterated the need for local artists to take advantage of new media networks such as Twitter, Facebook, MySpace, Tumblr among other. “I am simply saying srtists should be able to know how to use the Net because it brings the whole world int a single village. With the Net, the world is a click away. In the past Africa was regarded as a backward place but because of the Net we’ve an equal opportunity with the rest of the world. So artists should take advantage of social networks to market their products to the whole world,” he said. This entry was posted in Africa, Lifestyle, New Media, Zimbabwe and tagged Basement Nightclub, dance, gusto, Harare Rennaissance, Mbira, Music, nyunga nyunga, Passion, Power, Zimbabwe. Bookmark the permalink.